JustEat is doing this again! 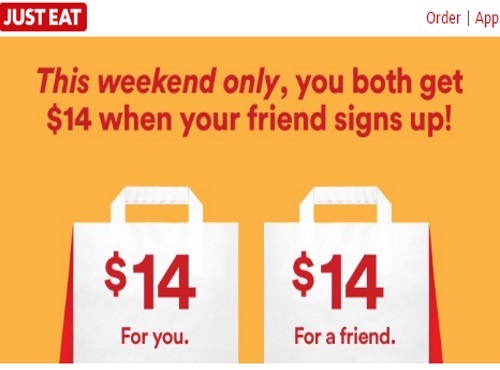 This weekend only, starting Thursday when you refer a friend to JustEat you both get $14 credit in your account! 1. Stay in and find something tasty to order online or on the free JUST EAT app. 2. On the "Order Confirmation" page, copy the "Give $14, receive $14" link, or share the links with your friends on Twitter or Facebook. 3. Once your friend signs up for a JUST EAT account, they will get $14 off when they order. The next day, you will get $14 too! 4. Order more from your favourite restaurant on JUST EAT with $14 off your meal every time a friend orders with your referral link! Recently JustEat updated their site and included Free Delivery on a lot of restaurants, which is awesome. They also have promo codes all the time to save you even more money! Click here to sign up with JustEat.